As part of their two-day protest demonstration, the Krishak Mukti Sangram Samiti held a protest meet in New Delhi’s Sansand Marg on Monday. More than hundred peasants’ organizations took part in the meeting. 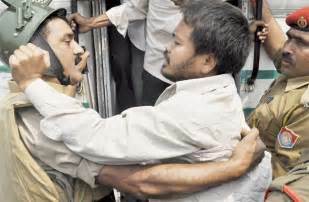 The peasant leaders demanded immediate release of KMSS president Akhil Gogoi who has been booked under NSA for allegedly giving provocative speech. Swaraj Abhiyan leader Yogendra Yadav who was present in the meeting said that Akhil had never said anything provocative. KMSS leader Bedanta Laskar also demanded the government to immediately release Akhil. He further demanded the government to waive off farmers loan and fix the MSP.